FireEye's revenue base has shifted in recent years. The last 12 months have been difficult for FireEye (NASDAQ:FEYE) shareholders, as stock in the cybersecurity firm has lost nearly 60% of its value. A series of poor earnings reports and management shakeups weighed on FireEye's performance throughout 2015. Fortunately, 2016 has, so far, been better. Although shares are still down heavily since last April, the stock is up more than 40% since the company's last earnings report in February. FireEye ended the year with a quarter that saw it lose less money than some had anticipated, and its management offered up guidance that was a bit more optimistic than some expected. Investors will see on May 5 if that momentum will continue when FireEye turns in its 2016 first-quarter earnings report. . Analysts expect the company to lose about $0.50 per share, with revenue of around $172 million. Better figures could send the stock higher in the near term, but long-term shareholders should focus their attention on a few key trends. FireEye's business increasingly depends on subscriptions and services. In 2013, about half of FireEye's billings came from the sale of products -- physical appliances that plug into corporate networks to monitor traffic and detect for unusual activity (FireEye also offers these products as cloud-based alternatives). But FireEye's revenue base has shifted in recent years. In 2015, products accounted for just 39% of FireEye's total billings. Management believes that will decline to 31% this year. Meanwhile, subscriptions have become far more important, rising from 50% of billings in 2013 to 61% in 2015. Management expects subscriptions to account for 69% of FireEye's billings in 2016. FireEye breaks its subscriptions down into two buckets: attached and stand-alone. When a customer purchases one of FireEye's appliances, they often purchase subscriptions at the same time (FireEye customers, for example, are required to purchase an annual subscription to FireEye's Dynamic Threat Intelligence Cloud as part of their initial appliance purchase). FireEye also offers some subscriptions on a stand-alone basis, most notably FireEye-as-a-service. Management hopes that demand for its stand-alone subscriptions will continue to rise throughout 2016, and account for about 35% of its 2016 billings, up from 26% in 2015. ...we essentially have a product platform that's an all-on-premise product platform, and then we have this sort of cloud version of the platform, and then we have this as-a-service component that wraps it. It's really the latter two that we see our clients moving to. More cloud, and obviously more as-a-service. FireEye-as-a-service is attractive to corporate buyers, as it allows firms to categorize their security costs as operating expenses rather than capital expenses, and offers greater flexibility. With FireEye-as-a-service, FireEye provides a team of its own security experts to monitor activity, and it can get clients up and running quickly. For FireEye, the long-term margins of a service solution could be more attractive. "...[O]ver time [we could] really deliver the entire as-a-service from the cloud with the software version, which could really improve the margins on it yet again," said DeWalt. Investors should look for management to provide more clarity on the ongoing state of this transition. FireEye remains unprofitable. For that reason, the company is often judged by its relative rate of growth. The size of FireEye's business has surged since it made its public debut, but the company still hasn't achieved the scale management believes is possible. In February, management said it expected FireEye's 2016 total billings to come in around $975 million to $1.055 billion. That would represent growth of between 22% and 32%. Revenue is expected to fall between $815 million and $945 million, up 31% to 36% from 2015. Any signs that FireEye is falling short of its targets could weigh on shareholders after the earnings report, but more specifically, there's one aspect of FireEye's revenue that should be monitored closely. Much of FireEye's 2015 growth was driven by international customers. 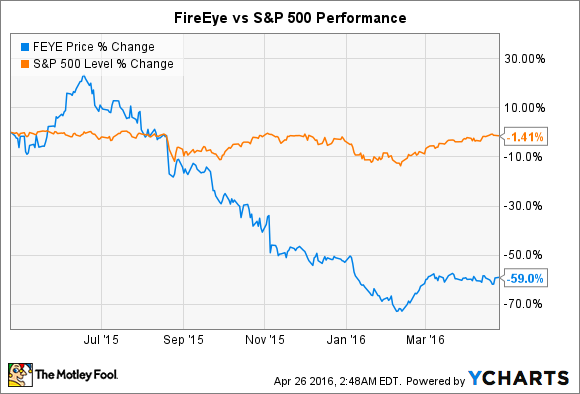 FireEye's domestic revenue rose 38% on an annual basis in 2015, but its international revenue jumped 73%. To be clear, domestic still accounts for the overwhelming majority of FireEye's revenue (70%), but international demand is key to FireEye achieving its long-term targets. Ultimately, FireEye will need to achieve profitability, or else be acquired by a larger firm, if it's to reward shareholders. Management believes profitability is possible in the long-run, and there's been some positive signs in recent quarters: in 2015, FireEye posted operating cash flow of $37 million, up from $131 million loss in 2014. The company doesn't expect to be profitable this year, but believes 2016 will see continued improvements. In February, CFO Mike Berry said FireEye will look to constrain its costs, and maintain flat operating expenses throughout the year. By the fourth quarter, it hopes its operating income margin will be -10%, up from -28% in the fourth quarter of 2015. Investors certainly should not expect FireEye to generate positive income in the first quarter, but improvements in cash flow would be well appreciated.